​Project Goal: The mission of the Cheboygan River/Lower Black River Watershed Initiative is to ensure high water quality and provide for the protection of wildlife by reducing amounts of nutrients, sediments, and toxic pollutants entering the River system. The Cheboygan River/Lower Black River Watershed includes a few coldwater trout streams. However increased sediment, nutrients, bacteria, oil/grease, and heavy metals, have threatened this use. Nutrients and bacteria, were identified as having the most harmful effect on coldwater fisheries. Wastewater, residential lawns and agricultural activities were deemed the most significant sources of nutrients and bacteria. Sediments were ranked the second most serious pollutant challenging the health of the of the watershed's coldwater fisheries. An over abundance of sediments in rivers and streams may block fish gills, destroy essential spawning habitat and reduce the amount of light available for healthy plant growth. Road/stream crossings and stormwater runoff are identified as being the most significant sources of sediment, however land development, streambank erosion and agricultural activities were also found to contribute significant amounts of sediment to the river system. Heavy metals, oil and grease are also considered a threat to the high quality coldwater fisheries. Stormwater runoff was identified as the most serious source of pollution in the warm water fisheries of the watershed. Stormwater runoff contributes a wide variety of pollutants to the lakes and streams of the watershed, including sediments, pesticides, oil, grease, heavy metals and toxic substances. The leading causes of pollution in stormwater runoff are impervious surfaces such as rooftops and parking lots. Nutrients and bacteria were also identified as detrimental to the warm water fisheries. Sediment, heavy metals, oils and grease, and pesticides are currently threatening aquatic life and habitat. Sediment affects aquatic life in the same way it affects coldwater fisheries; by clogging gills and decreasing spawning habitats. Heavy metals/organic compounds such as oil, grease and other toxic substances and pesticides can affect the life cycles of aquatic species by decreasing immunity and reproductive viability and, in high enough concentrations, cause death. Sources of sediment include road/stream crossings, streambank erosion, stormwater runoff, agricultural operations, land development practices and lake and river access sites. Sources of heavy metals/organic compounds include stormwater runoff, sites of environmental contamination and road/stream crossings. Common pollutants such as vehicle fluids (antifreeze, oil, grease, gas), pesticides, fertilizers, cleaners, paint products and bleaches can be carried directly to the river via storm drains. Recreation was identified as threatened by increased bacteria in the Cheboygan River/Lower Black River Watershed. High levels of bacteria can make swimming, canoeing, fishing and other activities, where individuals come in contact with the water, harmful. Although this has not been documented in the watershed in recent years, preventive measures need to be established to protect this designated use. The sources for bacteria include septic systems, livestock management practices and stormwater discharge. Improperly sited, designed, or maintained septic systems along the waterbodies can allow bacteria to enter lakes and rivers. Increased riparian development requires additional septic systems to be constructed. Also, many seasonal homes are being converted into year-round residences and the size or condition of the septic system may not be adequate to serve the increased use. Proper septic maintenance is imperative to reducing the amount of bacteria entering the river system. Livestock management practices, including the storage and application of manure, are significant sources of bacteria. Excessive manure application, runoff from manure piles and unrestricted livestock access, are all causes of increased bacteria entering the watershed. An increased rate of sedimentation is currently threatening navigation in areas of the Cheboygan/Lower Black River Watershed. Known sources of sediment include road/stream crossings, streambank erosion, agricultural practices and stormwater runoff. Other sources include land development practices and lake and river access sites. Sedimentation at road/stream crossings is often a result of short culverts, steep embankments, sand and gravel surfaces and inadequate diversion outlet. Public access sites located at road stream crossings need to have adequate measures in place in order to prevent erosion from occurring. Streambank erosion may be caused by foot traffic, lack of vegetation along the bank and natural hydrologic conditions. Unrestricted livestock access to the river can also lead to bank destabilization and sediment delivery to the river. Inadequate stormwater management can lead to the discharge of sediments into the river system. Oftentimes attached to sediment are other harmful pollutants including heavy metals, toxic substances and pesticides, which threaten other designated uses. The Environmental Protection Agency (EPA) is a federal agency that works closely with other federal agencies, state and local governments, and Indian tribes to develop and enforce regulations under existing environmental laws. 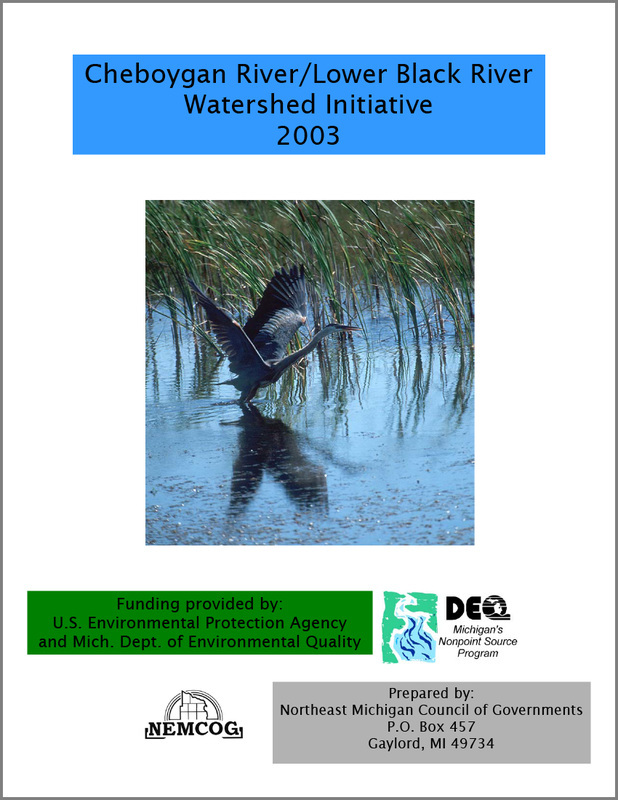 The Department of Environmental Quality (DEQ) has primary enforcement authority in Michigan for the Federal Safe Drinking Water Act under the Michigan Safe Drinking Water Act. The DEQ has regulatory oversight for all public water supplies, including approximately 1,500 community and 11,000 non-community water supplies. The program also regulates drinking water well drilling for approximately 25,000 new domestic wells drilled each year. Michigan has over 1.12 million households served by private wells, more than any other state. In addition to its regulatory activities, the DEQ investigates drinking water well contamination, and oversees remedial activities at sites of groundwater contamination affecting drinking water wells. Information concerning water systems in Michigan is maintained by the Michigan DEQ, and can be found on the EPA's Safe Drinking Water Information Site. The records at this site go back to 1993. For violations prior to 1993, interested parties may contact the operators of the water system in question, contact the State of Michigan, or file a Freedom of Information Act (FOIA) request. Community water systems serve the same people year-round, such as in homes or businesses. There are two community water systems active in the Cheboygan River/Lower Black River Watershed at this time, one of which is maintained by the City of Cheboygan, the other by a cabin/trailer park operation. The source of both wells is groundwater, with the City well serving a population of 5,295 and the park serving a population of 44. Neither well has had a significant violation in the last ten years. Non-transient water systems serve the same people, but not year-round (for example, schools that have their own water system). There are two such water systems located in the watershed, a rural elementary school and a large car dealership. Groundwater supplies both wells, serving a population of 266 at the school and 50 at the dealership. Neither well has had a significant violation in the last ten years. Transient non-community water systems are systems that do not consistently serve the same people. Rest stops, campgrounds, gas stations, motels and convenience type stores not hooked into the City's water supply would be included in this category. Most of the wells in the watershed that are not considered private wells fall into this group. Over fifty such wells are found in the watershed with the vast majority located in Cheboygan County. Ground water supplies all of these wells, and the population served by each ranges from 25 to 150. Ten of these water systems (all located in Cheboygan County) were cited within the last ten years for violation of the maximum contamination level (MCL) allowed (one system was cited three times during this period). In all cases, the contaminant was coliform. Not a health threat in itself; coliform is a bacteria produced by the waste of both plants and animals. It is used to indicate whether other potentially harmful bacteria may be present in drinking water. In most cases, compliance to the Safe Drinking Water Act was achieved in a timely manner; eventually all of these systems achieved compliance.